Jason Zucker (16) grew up in Las Vegas and played in youth ice hockey at the Las Vegas Ice Center and was a star roller hockey player here in town as well. Jason is now a star player for the NHL Minnesota Wild. Jason has been voted the Vegas Hockey Player of the Year for a record 12th straight time. Jason Zucker’s banner hangs proudly at two ice rinks in town – the Las Vegas Ice Center and at the SoBe Ice Center. Don’t worry – Jason skated out of this tough situation he was dealing with in a NHL game. 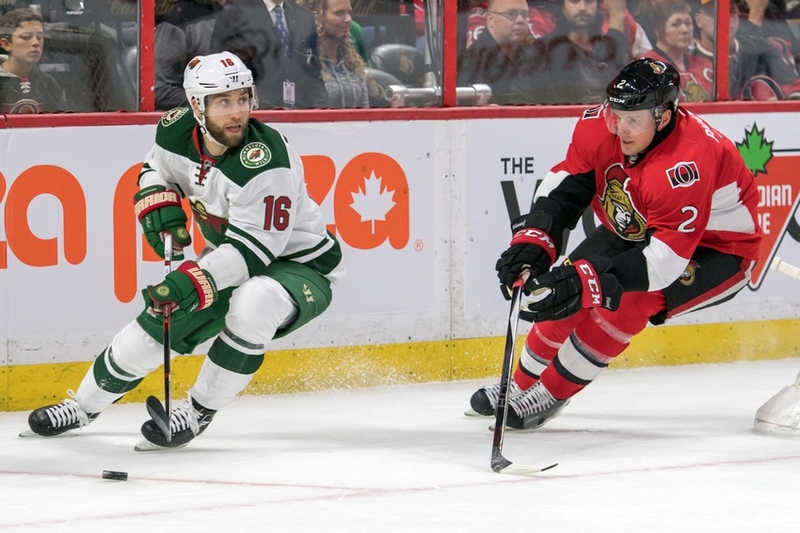 Our Vegas Hockey readers have made their choices and for the 12th straight time Jason Zucker, who grew up playing ice hockey and roller hockey here in town – and is a star player for the NHL Minnesota Wild – is the Vegas Hockey Player of the Year. Jason last played in Las Vegas at the age of 14 when he was on an AAA Las Vegas Storm 16u team coached by Wally Lacroix at the Las Vegas Ice Center. Jason has been a dynamite goal scoring force on every level he has played. Our readers voted for Anthony Greener, head coach of the UNLV Rebels, and Wally LaCroix, head coach of the AA Vegas Jr Golden Knights 16u as the Best Las Vegas Coaches of the Year. Greener, a captain and a top line player when he skated for UNLV, as a head coach has help lift the the Rebels to a competitive force on the ACHA D1 level. He is a repeat winner as the Vegas Hockey Coach of the Year. Zee Khan, GM of the Year with the UNLV Rebels said “it is a honor to be recognized by the Las Vegas Hockey Community for all of our efforts throughout the year, growing, not only for our brand but for the sport of hockey. “It has always been an our goal to have more kids get to the sport of hockey and also give high level players from all over the world an opportunity playing hockey at the highest level. Between Anthony, Nick, Arturo and myself we set our goals high. Transitioning from a D2 program, and becoming a perennial power D1 program required a lot of sacrifices from all of our staff and full committment from the players we being in each year. It is a privilege to be able to work in the sport of hockey each day. We are a family inside of our locker room. We have some big goals for the remainder of the 2018-19 season,” Zee said. Lacroix is a coach of an AA Vegas Jr Golden Knights 16u which has been playing at a high level all season at the SoBe Ice Arena. “We are still in the learning phase with our team but I must say I am pleased with our progress so far. There is a long way to go into this season but we’ve been on a fun ride with great young men on the ice for our team,” LaCroix said. Kind of sad that you don’t even mention Las Vegas MWHL Semi Pro Minor League hockey team the Vegas Jesters. The incredible work Head Coach Greg Norris, Owner Joe Magarelli, and GM Zach Snobel have done with this program is beyond amazing. Yes you mention 2 players at the very bottom as you scroll down but that doesn’t even begin to scratch the surface. Might be a good idea to get to know the team a little better and realize what these great people and this fantastic program are doing for hockey and our community.